See the others at Ready Made. 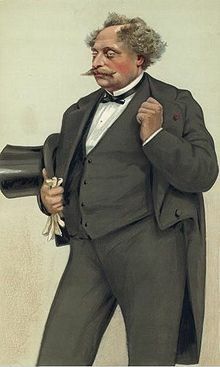 As we recall our roots, we might send heartfelt birthday wishes to Alexandre Dumas fils; he was born– the illegitimate child of Marie-Laure-Catherine Labay, a dressmaker, and novelist Alexandre Dumas— on this date in 1824. A novelist and playwright, Dumas fils is probably best remembered for his romantic novel The Lady of the Camellias (La Dame aux camélias); adapted into a play, Camile, which became the basis for Verdi’s 1853 opera, La Traviata… and then for any number of plays and movies, including Baz Luhrmann’s Moulin Rouge. Business? 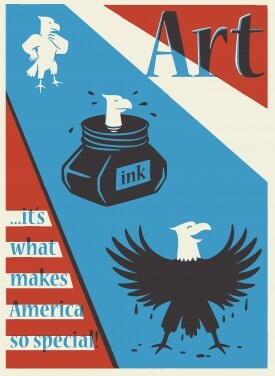 Why, it’s very simple: business is other people’s money. 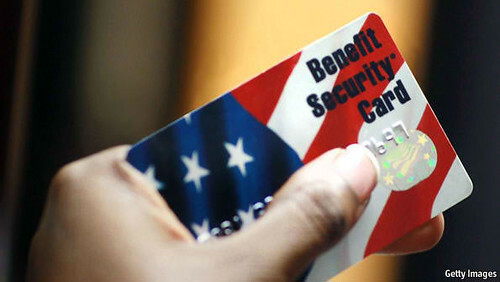 The Economist reports that participation in the U.S. Food Stamps program– designed to insure that poor Americans have enough to eat– had, by this past April, reached almost 45 million, or one in seven Americans. 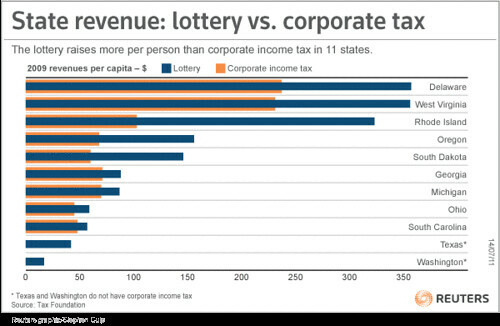 At the same time, Reuters reports that In 11 states, lotteries provided more revenue than the state corporate income tax in 2009… The Rhode Island lottery netted the state more than $3 for each dollar of state corporate income tax in fiscal 2009. As we strain to think of even more regressive ways to raise revenue, we might recall that it was on this date in 1932 that General Douglas MacArthur, on the order of President Herbert Hoover, led two regiments and six tanks against the Bonus Marchers in Washington, D.C. 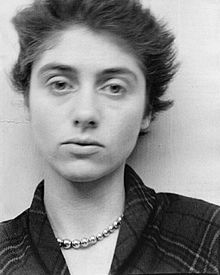 The Bonus Army was a group of 43,000 marchers– 17,000 World War I veterans, their families, and affiliated groups– who gathered to demand cash-payment of the certificates they’d been issued by the government at the end of World War Two as a bonus for their service. MacArthur’s cavalry charged the protestors’ camp, and his infantry entered with fixed bayonets and adamsite gas, an arsenical vomiting agent, evicting veterans, families, and camp followers. 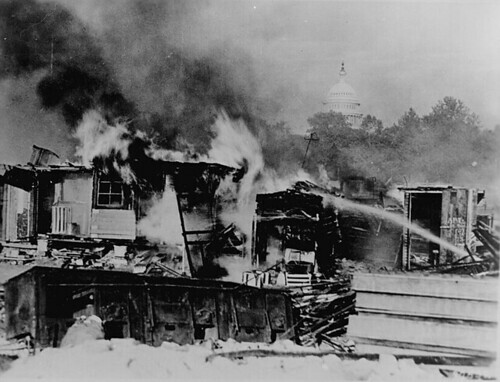 The Bonus Army incident proved disastrous for Hoover’s chances at re-election; he lost the 1932 election in a landslide to Franklin D. Roosevelt. But as Calculated Risk reports, while unemployment among the best educated is still lowest, it’s increased as much in percentage terms for them during this current recession as for any other group. One notes that all four groups** were slow to rebound after the 2001 recession– not an encouraging reminder if one is hoping for a brisk employment-led, consumption-fueled recovery this time around. I’d expect the unemployment rate to fall faster for workers with higher levels of education, since their skills are more transferable, than for workers with less education. I’d also expect the unemployment rate for workers with lower levels of education to stay elevated longer in this “recovery” because there is no building boom this time. 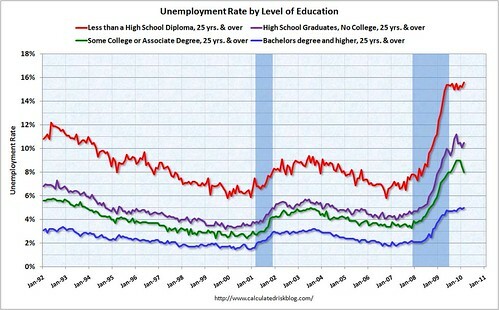 Just a guess and it isn’t happening so far … currently the unemployment rate for the highest educated group is still increasing. 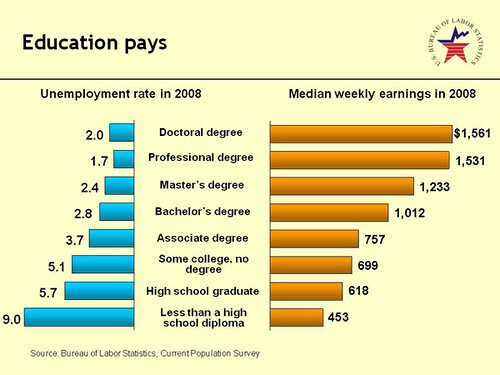 Clearly, from an individual’s point-of-view, it’s still smarter to get more education than less. But the perturbations of past periods remind us that the gearing between between academic degrees and financial success isn’t always perfectly tight… Indeed, those with sharply-defined professional credentials in fields– e.g, finance– that are unlikely even in the intermediate term (if ever) to recover their bubble-fueled growth rates, may find their advanced degrees at best unhelpful; at worst, downright prejudicial. Economic recovery and growth will be driven to some large extent by innovation; that innovation will create new– and new kinds of– jobs. Looking even just five years out, much less ten, one has to admit that it’s just not possible to predict what these emergent jobs, nor their requirements, will be. (Consider, e.g., the hottest topic– and job category– in marketing/advertising these days: “social media marketing”… which wasn’t even a glimmer a decade ago, and was just being born five year ago.) This is a challenge for those new to the work force, who have to wrangle the product of their schooling and their personal experience into a shape that can fit the entry-level positions they seek. 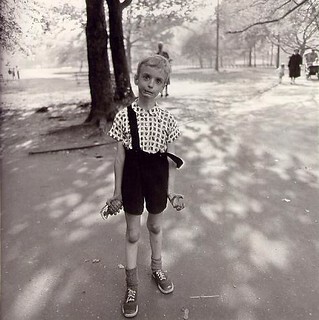 It is a much bigger challenge for those mid-career who find themselves needy of making a move: these more mature folks have not only to learn new fields, they also have to re-direct the considerable momentum of perception and habit that characterized their old– and they have to do those things, usually, in ways that justify salaries way north of entry-level. All of which underlines for your correspondent the extraordinary value of a liberal arts education. When one is faced with a “working adulthood” that is one transitional challenge after another, no skill is more valuable than the capacity to adapt. And no capability is more central to that adaptation than the ability effectively and efficiently to learn. This is precisely what, at its core, a liberal arts education is about: learning to learn. – 13.4% had less than a high school diploma. – 31.2% were high school graduates, no college. – 26.0% had some college or associate degree. – 29.4% had a college degree or higher. 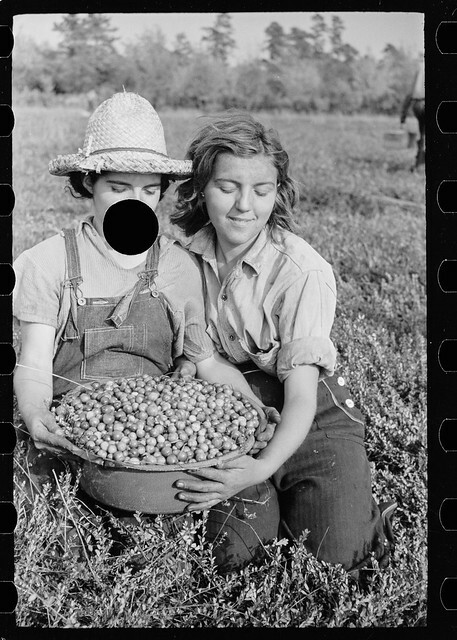 UPDATE: Reader JK directs our attention to another treatment of the data, in the NY Times. 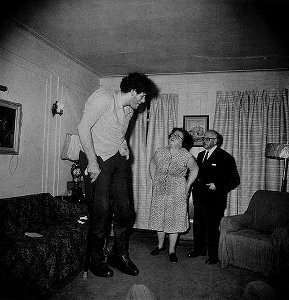 As he suggests, even more dramatic. 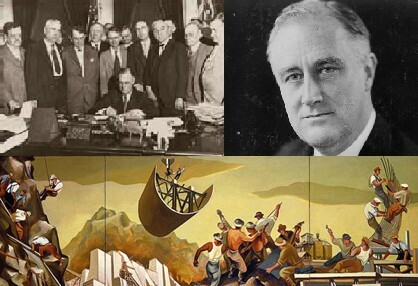 As we revisit our course catalogues, we might recall that it was on this date in 1933 that Congress passed the Emergency Banking Act, the first major legislative step in Franklin Delano Roosevelt’s New Deal program. 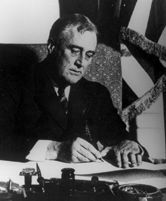 The sense of urgency was sufficiently high– four days earlier Roosevelt had declared a “Banking Holiday,” closing all of the nation’s banks– that most legislators passed the Act without even reading the single copy that was available for review. 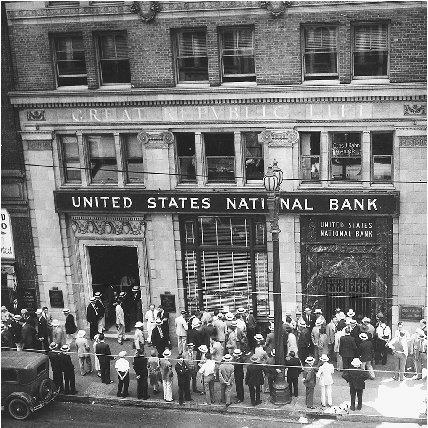 The EBA gave the government authority to shutter insolvent banks; that, coupled with the Federal Reserve’s informal-but-explicit pledge to guarantee the deposits of banks allowed to reopen (de facto deposit insurance), eased the crisis of public confidence: within two weeks of banks’ re-opening on March 13, Americans had re-deposited over half the cash they’d withdrawn and hoarded through the period of bank failures that marked the first chapter of the Great Depression. Later that year, the (more considered and embracing) Banking Act of 1933 replaced the EBA, and established such lasting practices and institutions as the FDIC.